Is specialized dog food for Yorkies different from regular dog food? So, what’s so different about the best food for Yorkshire Terriers? What are the daily nutrient requirements of Yorkshire Terriers? Is dry food better than wet dog food for Yorkies? What is the best dog food for my grown-up Yorkshire Terrier? How can I pick out the best puppy food for Yorkies? What is the best puppy food for my Yorkie puppy? Does special food for Yorkies help prevent hypoglycemia? Can I give my Yorkie puppy treats as well as his puppy food? Specialized dog food is always designed to address the differing needs of different breeds. In most cases, generic dog food brands will provide a cookie-cutter approach that assumes all dogs are okay to eat identical plain old kibble. In reality, this is very much not the case. So what’s so ‘special’ about special dog food, then? In short, giant-breed dogs like Great Danes and St Bernards are going to require a vast amount more calories than smaller or teacup-sized breeds like Chihuahuas or teacup Yorkies. Because Yorkies only usually reach an average adult mass of around 4 and up to 7 pounds, they’re sometimes only going to need about 15-20% of the calories of a giant-breed. A general vet-recommended figure will fall between 150-250kCal each day. That’s the number of calories which we humans get from a Yorkie Bar (the chocolate ones)! Obviously, teacup Yorkshires are going to burn a lot fewer calories and so will require something at the lower end of this scale, while those with longer bodies will often have greater body mass and require closer to the 250kCal mark. Yorkie puppies are an entirely different story. If you’re blessed with a newborn pup, you’ll know they can be as small as 4 ounces, which is incredibly adorable. However, Yorkie puppies grow fairly fast and are going to burn calories lots faster than adult Yorkies. They’re therefore going to need more calories overall until they’re at least 3-4 months old. The best dog food for Yorkie puppies will recognize this in its Yorkie puppy food recipe, by packing in more calories from healthy sources like natural protein and fats. Specialized food for Yorkshire Terriers will also account for the fact that Yorkies need to be fed more frequently than medium- to large-breed dogs. The reason being, as smaller mammals, they’re technically metabolizing their dog food or puppy food a bunch faster than most other, larger breeds. Since they’re metabolizing dog food faster, special dog food for Yorkshire Terriers will be formulated so you can feed them at least 3 times daily. It’s super important you’re aware of the fact that Yorkies and Yorkie puppies can become hypoglycemic if they don’t eat often enough. This means they’ll get low sugar, and it’s possible they may faint. There’s actually lots of debate around the right amount of protein a good Yorkie dog food should contain, and the same applies to good puppy food for Yorkie puppies. A commonly agreed upon figure amongst Yorkie owners, breeders and vets is something that’s at least 28% protein. If you see SUPER amounts of protein in a dry kibble (think 42%+), it generally means the dog food you are checking out is designed for either larger breeds or working dogs who burn SUPER amounts of calories each day. This won’t typically apply for the average Yorkie or Yorkie puppy. You may find top quality food for Yorkies with higher than 28-30% protein content. This may mean it’s specially designed food for Yorkie puppies. In this case, there’s little need for worry, because Yorkie puppies do in fact require more daily protein than Yorkie grown-ups. A little more than the recommended protein in dog food for Yorkies isn’t often a problem unless your Yorkie has a kidney problem. If your Yorkie doesn’t have kidney issues, excess protein is generally excreted by his body with no problems, but it’s always essential to take your Yorkie or Yorkie puppy to the vet for regular check-ups. As with other dog breeds, a suitable dog food for Yorkies, or a suitable food for Yorkie puppies should have something around 10-17% of its nutrient profile as fat. The lower end of this range will be relevant for mature Yorkies, while figures closer to 17% relate to the recommended content for a good food for Yorkie puppies. This fat should be from healthy sources- and for Yorkies and Yorkie pups this means you should keep your eyes open for something like chicken fat or similar as the primary fat source. 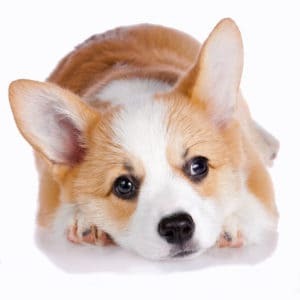 Dogs don’t require carbohydrates as part of their diets. However, dry dog food for Yorkies and dry puppy food for Yorkies does require carbohydrates as these play a fundamental role in kibble structure, and so it lasts without going off on the shelf. When you’re considering Yorkie dry dog food or a puppy food for Yorkies, you’ll often want to pass over dog food products with overly high carbohydrate component. Definitely DO steer clear of dry dog foods and puppy foods listing a number over 70% for carbohydrates, as your Yorkie puppy or Yorkshire Terrier may end up suffering from digestive problems and diarrhea when he can’t digest this properly. The best dog foods and puppy foods for Yorkies should, actually, be the dog food that works best for both of you. 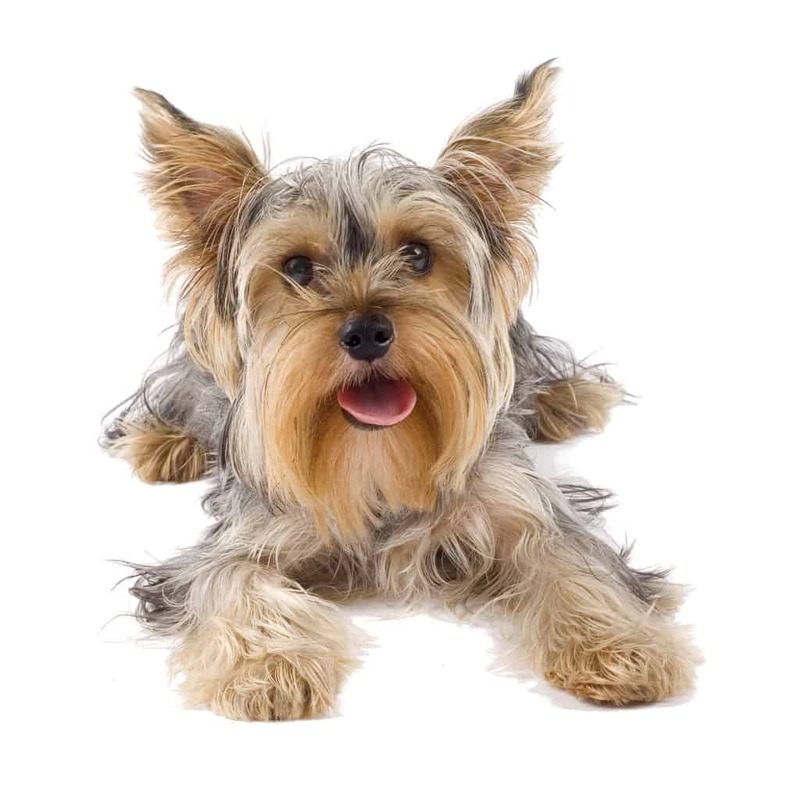 While the health of your Yorkie or Yorkie puppy should always come first, there are a few things to consider when deciding whether to buy a wet or dry dog food for your Yorkshire Terrier. Dry dog foods will tend to be more on the economical side of things for you as his owner. The cost of a special dog food for Yorkies will, however, be much less of a concern with Yorkshire Terrier owners than it is for owners of larger breeds. Because Yorkies eat relatively much fewer calories than dogs falling in the larger-breed categories on a daily basis, you won’t have to worry as much about buying bag after another of dog food all the time. This lets you spend a little more on the premium brands to ensure you’re truly giving your Yorkshire Terrier the best food for Yorkies. Dry kibble for grown-up Yorkshire Terriers, like dry food for Yorkie puppies, will also last longer on the shelf than wet dog food or wet puppy food. Wet versions of dog food typically don’t have more than 24 hours in the fridge, before they go off, and out the fridge you’re looking at a lot less time than this. It means you’ll need to purchase more cans, more often, than if you go the dry dog food route. On the whole, we suggest you don’t worry too much about whether to feed your Yorkie or Yorkie puppy wet or dry food. A combination of both can give him a chance to enjoy a change, after all, and as we said earlier, your Yorkie’s health is number one. What’s most important is taking care that your Yorkshire Terrier is getting an appropriate supply of nutrients, protein, fat, and calories alongside a sufficient supply of water. In fact, we’ve already picked out some top makers of great food for Yorkies based on vets’ recommendations and the key pointers we’ve outlined- all to save you time! 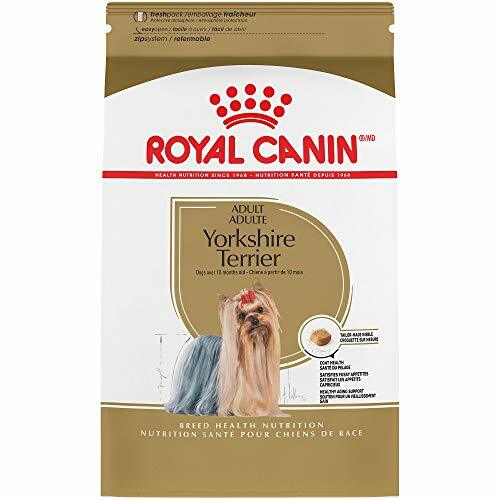 Three top ingredients aside, Royal Canin makes some great dog food for Yorkshire Terrier adults, with carefully balanced proteins, fats and the necessary extra nutrients for top Yorkie health. We’re happy to say this is very much a good dog food for your Yorkie adult! It’s breed-specific, which we love, and we always like when we notice a dog food for Yorkies has real chicken meat as a top ingredient! 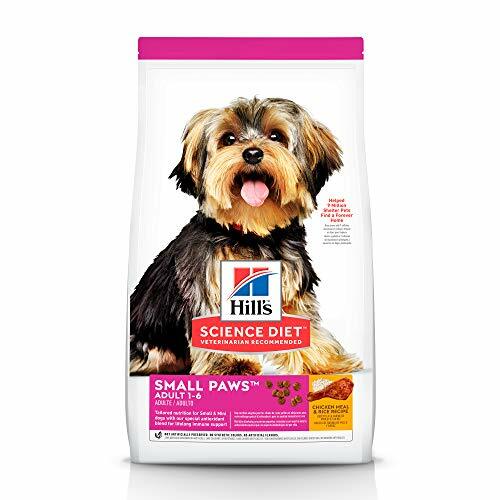 Overall, we’re pretty impressed with Hill’s dog food for Yorkies. It ticks all our recommendation boxes, and it’s pretty economical too! Has zero meat by-product meals! Not really, we love it! DHA, a special dietary essential for vision and cerebral development, which your Yorkie puppy will require from his puppy food once he’s weaned off his mother’s milk. On top of all this, if you’ve got a brand new Yorkie puppy straight from his mother, you may not yet know if he’s sensitive to ingredients such as egg or low-quality filler grains like soy or wheat. This makes grain-free options amongst some of the best puppy food for Yorkies. 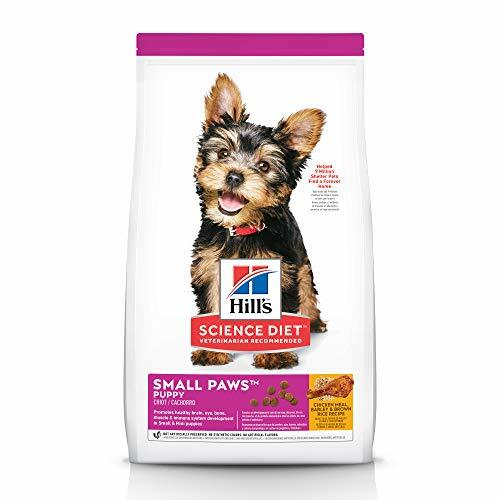 We wholeheartedly recommend this puppy food as one of the best puppy foods for Yorkshire Terriers. 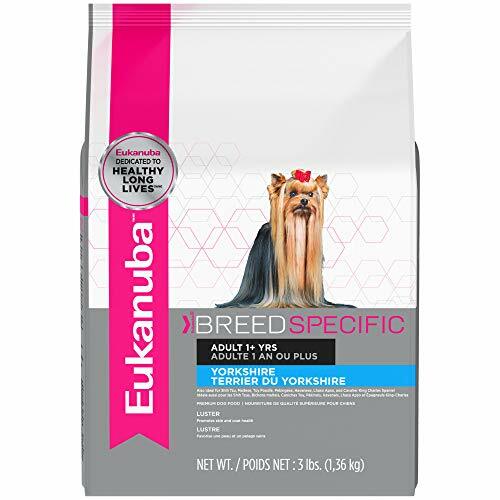 It’s got an amazing nutrition profile and it’s calorie-balanced for growing Yorkie pups, who must be fed at least 4 times a daily. Five stars! None, really, in our opinion! Made with natural DHA fish oil sources, number one ingredient is chicken meal, and packs in 30.5% protein! Number one ingredient is chicken meal, and packs in 30.5% protein! Made with green peas, carrot, broccoli, and cranberries! 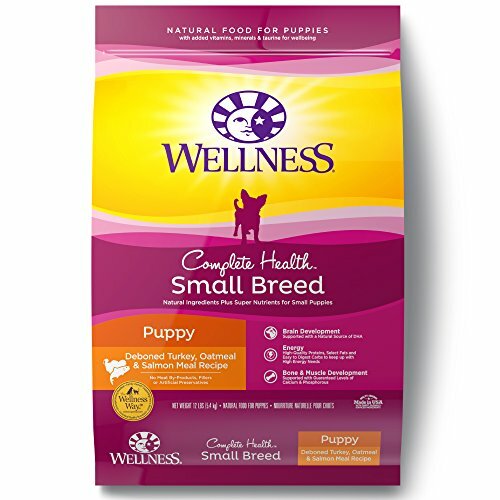 Technically, grains such as rice and wheat are not unhealthy for Yorkies, they’re just more of an economical ingredient to bulk up a puppy food. Still, what matters most is the nutrient profile of a dog food and not the individual ingredients. 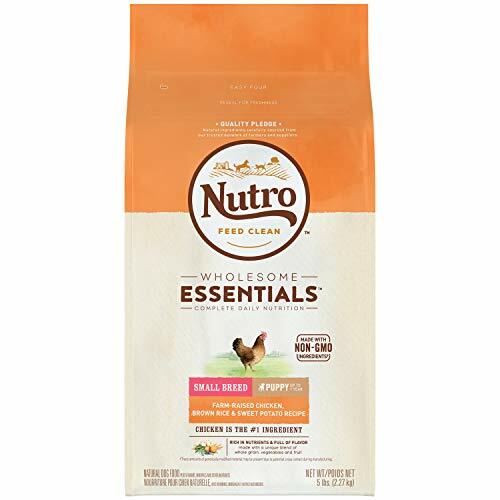 We’ve looked at the nutrient profile here and we believe Nutro makes one of the best puppy food for Yorkies! Made with apples, carrots, and apples for a vitamin boost! Absolutely. The well-known brands making specialized and high caliber food for Yorkies (and those making the best food for Yorkie puppies, of course), tend to set themselves apart from regular dog food brands because they consider your Yorkie’s special dietary concerns. Because Yorkies are small-breed dogs that need to eat regularly throughout the day, the best food for Yorkies will be somewhat lower in carbohydrates to prevent them ‘crashing’ sugar-wise after a high carb meal. In other words, the formulas of the best food for Yorkies will be designed to help stabilize the levels of sugar in their blood all day long. It’s not so bad to give your Yorkie puppy a few healthy treats throughout the day! If your Yorkshire Terrier puppy is active and getting enough exercise, then you don’t need to worry too much if you’re also feeding him some small snacks on top of his puppy food. The key is to pick healthy snacks, such as raw or steamed vegetables. While the best food for Yorkie puppies will tend to include vegetables as part of its unique mix, a snack like a carrot or some broccoli can help boost your Yorkie puppy’s vitamin and mineral intake. Healthy snacks in moderation can be a lovely treat, and as part of a healthy diet that incorporates special nutrient-rich food for Yorkie puppies, can be a great way to bond with your pup!